Qublix Games has released its newest puzzle title on Facebook: Fruit Farm Frenzy. 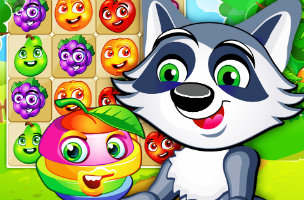 In each level of the game, players help a raccoon drop fruit onto the screen to make matches of three or more fruits that touch in some way. That is, gamers can form horizontal and vertical lines of fruit, but diagonal and L shape matches also qualify. When matched, these fruits are removed from the screen. Players will need to drop enough fruit in each stage to finish specific goals, without letting rogue fruits reach the top of the screen and end the game. Each level of Fruit Farm Frenzy has a move limit, giving players a limited number of fruit to drop onto the screen. Some stages may simply ask players to collect enough points to earn a single star before running out of moves, while others ask players to remove a large number of particular kinds of fruit, like apples or grapes. Some levels simply ask players to collect large numbers of any fruit in bulk (say, 60 fruit), and so on. Adding to the challenge, many levels contain fruits trapped in jars, which must be freed by making a match next to these jars. When fruit disappears from the screen, the rest of the board shifts with the help of gravity, and large combo moves are possible as fruits fall into matches after a move. As players drop fruit, they’ll fill jars on the side of the screen. For every three moves (that is, every three fruit dropped onto the screen), a new row of fruits is automatically added to the bottom of the level. It’s this feature that gives users enough fruit to actually keep making matches, but also challenges players to not allow one column on the screen grow too tall. For “crowd control,” players can create juice boxes when destroying groups of six fruit in a single drop. These juice boxes can then be used in a match to create an explosion, which removes all nearby fruit from the screen. What’s more, making a match with eight fruit pieces creates a rainbow fruit, which can be used to remove all fruit of a single color from the board. While these can be formed by players during a level, rainbow fruit can also be purchased before beginning a stage. An additional power-fruit functions as a weight, and drops down a single column, removing all fruit underneath it. In addition to rainbow fruit, players can purchase extra move packs for levels, the ability to see the next two fruits in the drop queue, and juice boxes that are added to the board, all before ever beginning a stage. Mid-stage, players can purchase pineapple grenades that cause explosions similar to juice boxes, and other powers. All of these cost coins to purchase, which themselves are purchased with real money. Players earn up to three stars based on their performance in each level, and can replay stages to earn missed stars or simply increase their high scores. Users can also check out their friends’ scores on each level’s leaderboard. Fruit Farm Frenzy is available to play for free on Facebook.